Station wagon backends are like hats: the jauntier the angle the more fun that’s implied. The angle of the rear glass on today’s Nice Price or Crack Pipe Audi Avant is pretty steep and the car looks pretty fun. Let’s see if its price is equally steep and, well, less fun. What’s the one item you’ve owned the longest? For me I think it’s the headboard on my bed. It followed me well into adulthood and even into married life. I’ve never thought of any possible reason to replace it. It’s not often that you come across an item that can serve you for the long run, but yesterday’s 1979 Toyota Hilux might be a good candidate for a life partner. Seemingly in decent shape, that truck’s $2,300 reflected both its age and parsimonious kit, if not its Swiss Army knife nature. Most of you recognized that however, and lauded the Hilux with an 85-percent Nice Price win. Some things and people aren’t keepers, they simply pass through our lives. They may not stick around but I think their transient nature makes you enjoy the moments you get with them all the more. This 1987 Audi 5000 CS Quattro Turbo Avant is a car that you might want to enjoy for a time, and then pass on to another. After all, nobody likes it when you bogart the Audi. First off though, let’s get through that lexicon of words and letters in the car’s name. Audi we know, that’s the four-ring brand, the reformed remnant of the late Auto Union empire. 5000 is the name Audi came up with when replacing the 100 in the American market in the late ’70s. The 100 name had been tarnished by reliability issues and so Audi went for a bigger number which perhaps they thought implied greater quality. The company would go back to the hundred series naming convention after a poorly conceived 60 Minutes spot damned their car as dangerous. Today, the model goes by A6 and everybody’s happy. CS is this car’s trim level which is upscale, featuring the optional heated leather seats and other niceties. Quattro is the name of Audi’s all-wheel drive system, which in this 5000 comes in Quattro I form with dashboard indicators and a manual locking switch for the diffs. Turbo indicated that the 2.2-litre five cylinder right-leaning in the engine bay is pressurized. That one was a gimme. Finally, Avant means wagon, which in C3 form also means it is one of the best looking cars Audi has ever produced. Put it all together and you have this remarkably clean and desirably kitted ’87 machine. The car comes in Tornado Red over Sierra Beige leather and looks to be ready to take on whatever you’ve got. Wheels are Ronal Swings in dark grey, and even the seller admits they aren’t the most flattering. Glass all around is good, and while the ad notes some wear and respray in the paint, and very minimal rust. It all seemingly holds together though, at least in the pics. The interior is amazingly intact, with leather that’s not un-seam-ly and only modestly worn. There is a child safety seat in back shown in the pics. You should probably check it for occupancy before you drive your new purchase home. Nobody needs another mouth to feed. A Clifford alarm has been added with an activity light cut through a blank switch on the dash. Below that is the Cadillac climate control which is mostly for show at present since the seller says the A/C blows warm. It could be as simple a needing its Freon refilled. Or not. A five-speed stick (notchy as hell in my experience on these cars) sits below that, and that is attached to the 162-horsepower SOHC inline five under-hood. Starts every time, no drama, no matter how hot it is or if it’s been sitting for days. Doesn’t stall, no weirdness. No shimmies or shakes, but does have a squeak I’m working on. Drives and stops straight. New rear pads and rotors last year. The only major issue, aside from the poor-functioning A/C, is a CEL that comes on under acceleration. That’s generally indicative of a misfire, but this is a pre-OBD car so it’ll take some detective work to figure that out. The ABS light is also on, and the best place to check for fixing that is in the fusebox. There are 178,000 miles on the clock and the Carfax does report an Exceeds Mechanical Limits event, however that was between 30 and 35K. The title is clean and the Carfax is otherwise unremarkable. 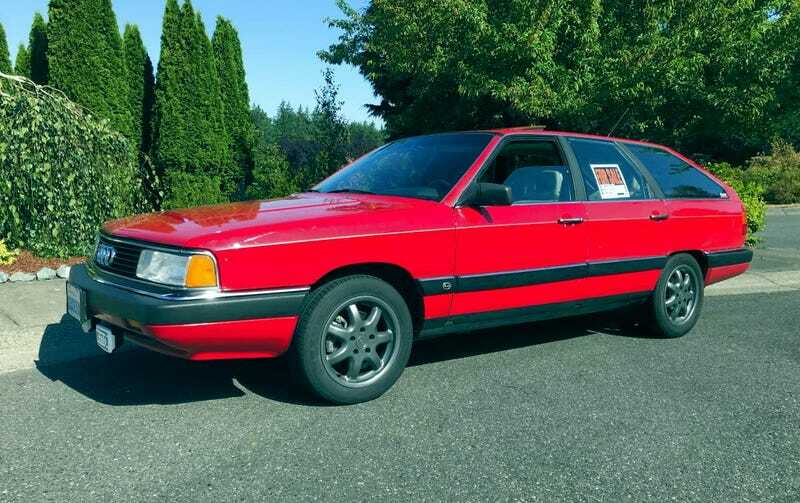 The price tag here is $4,500, which is a lot for an ’87 Audi. But then again, this is a lot of ’87 Audi. It’s kitted in the manner we all might like, and you’d be hard pressed to find one in better condition that wasn’t owned by some creepy OCD sufferer who dusts the car every ten minutes, wraps the wheels in booties, and gives you disapproving looks when you stare at it with your dirty eyeballs. This one seems ready to drive (check that baby seat first!) and in decent shape as long as the weather’s not too hot. Would that $4,500 price however make you ready to pull the trigger? Bellingham, WA Craigslist, or go here if the ad disappears.